A few days on home turf gave me another opportunity to visit the Bribie Pumicestone Passage flats in search of flathead. I am enjoying the later starts for fishing trips at this time of year. I woke at about 4.45 am and drove up to Bribie, from Brisbane.Low tide would be at 6.18 am, coinciding almost exactly with sunrise. It was 4 days after the new moon. The wind would be a very light south easterly. I pulled on my waders and waded out under the Bribie bridge at about 5.40 am. As the seasons come and go and the predominant wind direction alters, the tidal flats change shape quite dramatically. For example, just to the north of the bridge on the mainland side a big sand bank is forming and the weed is growing very quickly. However just to the south of the bridge the rubble bottom is becoming more exposed and there is less weed. These changes are best viewed at absolute low tide and it is good to keep an eye on them. I started fishing with a GULP Crazylegs Jerkshad in the Curried Chicken colour, on a 1/8th ounce, size 1/0 hook jighead, tied on with 12lb fluorocarbon leader. It was still dark but the sky was starting to turn a magnificent red colour. I was standing on the rubble bottom just to the south of the bridge. I was casting towards the bridge and hopping the lure back along the bottom towards me, in line with the tidal flow. I cast the soft plastic lure in the direction of a pylon and kept it moving quite quickly, to avoid getting snagged on the many rocks in this area. The tide was ebbing and the water flow was slowing as we got close to low.As is often the case in the predawn light, a flathead slammed the lure and almost jumped out of the water in its desire to swallow it. It was well hooked and I soon had my first fish of the day – it was just short of 50 cm long. The sun came up and I moved south. The tide slowed and so did the fishing. I covered a lot of ground without a bite. I worked through a few soft plastics and tried a small hard bodied minnow for a while. I caught nothing for the next 90 minutes as the tide turned, and started to run in. At about 8.30 am I was fishing with a GULP 4” Minnow soft plastic in the Pearl Watermelon colour. I was just to the south of the old oyster jetty. 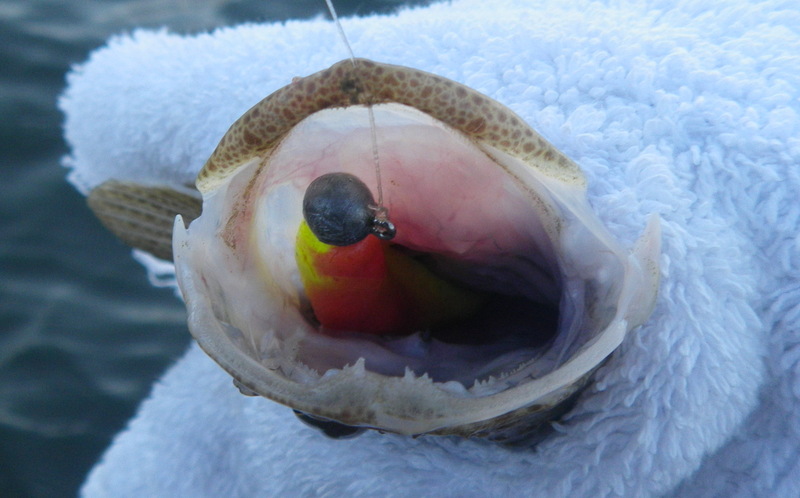 A flathead burst out of the water behind my lure as I lifted it out of the water, at the end of the retrieve. It missed. I moved back and let things settle down. About two minutes later I threw a short cast at the area and felt the bite. This time I hooked it. It safely pulled it ashore. This one later measured 46 cm. I carried on back towards the bridge as the tide pushed in. I caught another flathead just north of the jetty, but it was under 40 cm long, so it went back. It was just after 9.00 am when I reached the bridge. I cast around just to the south of the bridge where I had caught the first fish of the day and was rewarded with another 45 cm flathead. As I waded north under the bridge I put in a few casts and caught my final fish. It was a small flathead of some kind with frilly fins. I released it and gave up for the morning. 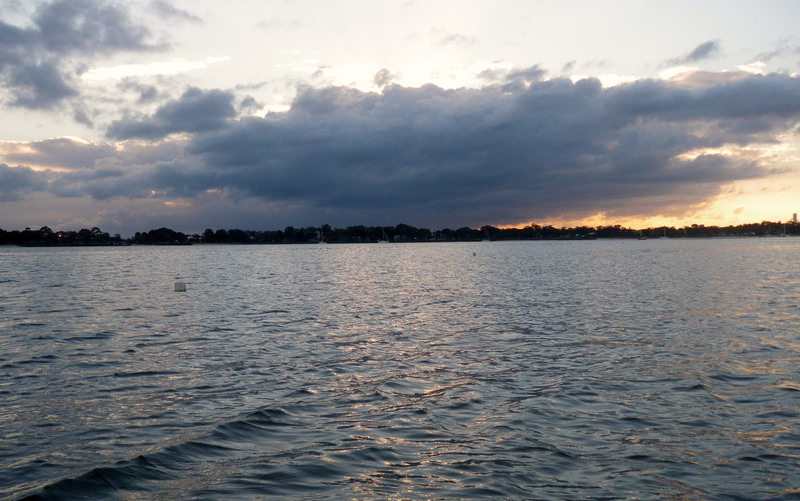 Another late report – but it may be relevant for anyone planning to fish at Bribie over the school holidays, to get a feel for what is going on. I am planning to get down to Iluka in the next few weeks, so watch this space for a bit more variety. So I drove back up to Bribie Island to fish my favourite spot on the mainland side of the Pumicestone Passage. I arrived just after first light at about 5.00 am. Low tide would be at 5.25 am. There was a light southerly wind blowing and it was cloudy. There was a fair amount of bait jumping around under the bridge lights so I decided to start fishing in that area. As I walked out under the bridge I noticed plenty of ‘lies’ showing where the flathead had moved up to feed on the night time high tide. I started with a small 3” GULP Minnow soft plastic in the Smelt (Grey & white) colour. This plastic looks like just about any small profile bait fish and has a nice soft texture. I cast it towards the edge of the reef, just to the south of the fifth bridge pylon. I waited for it to sink to the bottom and as I lifted, a fish attacked. There was no hesitation and this one hooked itself, as soon as it bit down. It can be a challenge to keep your fish in this area. There are lots of big clumps of weed and rocky outcrops. This fish was a good size and it wrapped itself around a few large weed clumps. Fortunately, the water was shallow enough and I was able to walk up close and free it. After a few minutes of back and forth, I pulled it safely to shore. A solid 57cm flathead, on my first cast – it was a great start. I tried in the same area for another, but I think my wading around had spooked any remaining fish. It was now low tide and the water was not really moving. I waded to the south. I moved past the old oyster jetty and swapped to the paddle tailed Mad Scientist 6” Optishad soft plastic. I was fishing with a 1/8th ounce, size 1/0 hook jighead and 10lb fluorocarbon leader. At about 6.30 am, I found another flathead, about 40cm long. Then about ten minutes later another smaller fish. As the tide started to run in, I made my way slowly down to the channel marker, casting into the current and found four more fish – all on the Mad Scientist soft plastic. Only two were about 45cm so I added these to the first one for a family supper. At about 9.00 am I stopped for the day. I had caught a few good fish around Bribie Island through the week. There was plenty of variety – Estuary Cod, Mulloway, Bream, Flathead, Whiting, and Pike all put in an appearance. Despite some good catches, the fishing had actually been quite tough with a long time between bites. 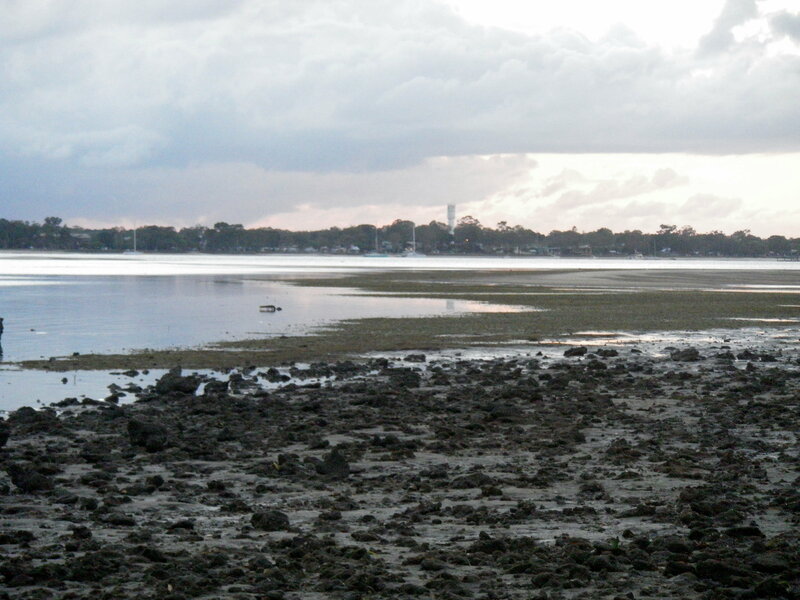 On Sunday I decided to stay on the mainland, opposite Bribie and fish the old oyster jetty flats. Low tide had been would be at 6.02 am and I arrived just before first light at about 5.30am. There was no wind to speak of. I waded out to a point about half way between the green channel marker and the oyster jetty and started casting with a GULP 4” Minnow in the New Penny colour, on a 1/8th ounce, #1/0 hook, jighead. I was sticking with the light 8lb fluorocarbon leader as fishing light had worked well, earlier in the week. I tried everything; big plastics, small plastics, different retrieve. At one point I thought I had found some fish but the rabbit like bite marks showed they were probably those revolting spiny toad/ puffer fish, which sometimes float around here. The tide eventually started to run in but this did not stir things up. There is a big trawler moored in this area at the moment and for some reason it was running its engines – perhaps this noise did not help. The weather has been so good that that by 9.00 am, when I gave up, there were boats and kayaks everywhere. It had been a tough morning but it is always better to have tried and failed than to not have tried at all! A late start on Friday and wet weather again. I drove up to Bribie and passed through several showers on the way. I arrived at Bongaree at about 9.30 am. I stopped in front of the Seaside Museum again and parked up. The tide had been high at 5.45 am, so I could now easily reach and cast over, the coffee rock ledge that runs along, parallel with the road. Surveyors were measuring up for a new sea wall – the current slope is sinking and sagging after all the wild weather. Hopefully work on the new one will create some new fishy structure. I started fishing with a GULP 3” Minnow in the Pearl Watermelon colour on a 1/8th 1/0 jighead. I was using 8lb leader again. After a few casts I hooked a fish. It made a few runs then I pulled it over the edge. It was a good bream, about 34cm long. It was not long before I had another fish on. This time it swam under the ledge and soon rubbed me off. I did not get a look but it felt like another decent bream. I carried on in the same spot and after a few more casts, I felt another solid bite, as I lifted the soft plastic off the bottom. On the next cast, I paused a little longer with the soft plastic on the bottom. When I lifted it, a fish struck. It pulled quite hard but I was now level with the ledge and so I could keep the fish away from it. When it came in to view it was only a 25cm Moses Perch! I moved a bit further south and kept casting. A few more casts and I had another fish on, this time it was a Tailor. It pulled very hard but it was nicely hooked so it could not bite through the leader. I pulled it up to the sand. It was just about 35cm long but I released it after a few pictures. I checked the leader and thought about upgrading to 12lb, but could not be bothered. On the next cast I wished I had. A fish hit my plastic just a few inches out from the ledge and took off. This fish had weight and power but was not mad like a Tailor. I started swimming north, parallel with the shoreline and I went with it for about 10 metres. I tried to keep it away from the edge but my light spin rod was no match for it. It found a ledge and I could feel the leader rubbing and then it was gone. I suspect it was a jewfish but I will never know. I fished on as the tide slowed and picked up another respectable 32cm bream on the Gulp 3” minnow in the Sardine colour. On the bottom of the tide the weed was clogging every cast and the sky looked ominous so I packed up. On Saturday, I decided to brave the strong forecast north-easterly on the ocean beaches of Bribie Island again. The wind was not the strong northerly, as forecast and was actually a westerly, at first. The tide was coming in and would be high at 9.44 am. The moon was full and the predawn sky was an amazing red colour. This time I walked from Skirmish Point to the end of Red Beach, across the southern end of the island. I used my light spinning outfit, casting small soft plastics on a 1/8th 1/0 jighead. Every time I saw some bait or surface action, I would cast a soft plastic minnow or shrimp in that direction. I got a few bites and lost a few soft plastic tails but after two hours fishing, I had landed nothing and the wind was blowing 20 knots towards the north east. On Sunday, I woke to a howling south-easterly and decided there was nowhere worth fishing, first thing. The wind blew all day and if anything, was even more powerful by late afternoon. I drove round to the mouth of the Spinnaker Sound Marina. I assumed no one would be mad enough to put their boat in so much wind – but at Christmas there are some real die-hards out there. There was a steady stream of boats going out and then coming back, 20 minutes later. I caught nothing and went home about 30 minutes after sunset. This will be the last post for 2012 – lets hope for some monster catches and great stories for 2013 – Happy New Year! A week away from fishing is far too long. I had time for a quick fish on Monday morning, so I drove up to Bribie at about 4.00 am and arrived just after first light at about 4.50 am. The tide was coming in. It would be a 2.3m high at about 9.00 am. The wind was forecast to be a southerly but it seemed to be a cool south-westerly. A quick look at the flats on the mainland side of the bridge showed that I would be able to fish along the edge of the weed banks, to the south of the (newly repaired) Oyster Jetty, for an hour or so, as the tide came in. It is nearly new moon so it would be coming in fast. I was fishing with my Loomis GL2 light spin rod again. Unfortunately there was plenty of snot weed around, especially close to the jetty. I started with a 1/8th 1/0 jighead and a GULP 5” Jerkshad in the Curry Chicken colour (red and yellow). I had a 12lb leader on, in case I came across any Tailor. The water was warm but the wind was cold. The Loomis lets you feel everything the jighead touches and it took some time to get used to it. After a while, I could tell that the difference between a nibble and a jighead stuck in the weed again. Then, about 50 metres south of the jetty, just before 6.00 am, I had a solid bite and the line pulled tight. I was too eager and wrenched up the rod tip, pulling the jighead out of the fish’s mouth. Patience, patience – sometimes you have to go back to the beginning and slow everything down. If it was a Flathead, it was probably still there, or one of its friends was. I cast back in the same spot and after two hops I felt the faintest of bites. I dropped the rod tip and counted slowly to 10, then lifted it sharply. I had it this time. 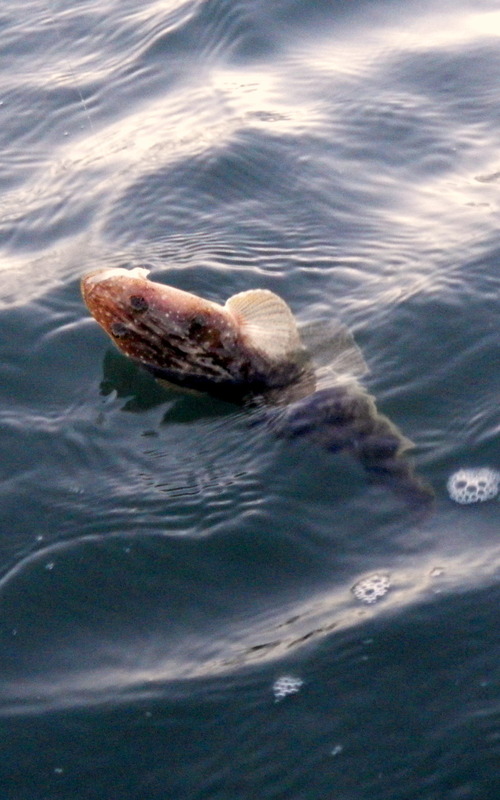 It was a small Dusky Flathead – just about 40 cm long. I let it go, hoping the fishing Gods would reward me with a better fish. Suddenly, there was a big surge about 10 metres away to the north and the baitfish went flying everywhere. Then there was another, about 5 metres further away. I wound in furiously and hurled the plastic in the direction of the splashes. It went quiet for a few minutes and then the same thing happened to the south of me. This time I saw the broad shoulders of a good size Tuna as it smashed into some Herring. I cast where I thought they were travelling but again I could not tempt them – they were moving too fast. I carried on casting around for Flathead, walking gradually further south. At about 7.30 am I was considering giving up when there was a swirl a few meters in front of me and another bait spray. Then I saw a good size Tuna coming right for me. I thought it would hit me but it swerved at the last minute and the small school flashed by, on either side of me. I was wading in just over a metre of water. On Saturday morning everything had calmed down and the weather looked perfect again. The fish were singing to me in my sleep and I woke up at about 4.00am. It was a cool morning but not as cold as forecast. There was a slight breeze from the west. I decided on Bribie Island again and started under the bridge on the island side at about 5.30 am. I could not find anything here so just before first light I moved down to Bongaree, in front of the old seaside museum. It was just about on the 1.9m high tide and I waded out along the sand bank beside the mouth of the drain. The water here was still slowly running in. I started with the GULP 4” Minnow in the Smelt colour, on a 1/8th oz 1/0 jighead and 12lb fluorocarbon leader. I cast all around but I could not yet reach over the edge of the drop off that runs along here. The water slowed down. There were a few bust ups at the edge of the main channel and there was a large flock of birds following a school of something around. I could not find anything. I tried a few other plastics then reverted to the Smelt Minnow again. It was now about 7.30 am and the tide was really running out, I cast nearer to the edge of the drop off and felt a bite. I paused then struck. It was a Flathead about 35cm long. It was nothing spectacular but it was good to get started. I released it and cast back in the same spot. After a few more casts I was on to another fish. This time it was about 40cm long. I let it go and then things wnet quiet. There was still too much water to fish where I wanted too so I went and bought a cup of coffee. I came back to the water and sat on the sloping rockwall, just in front of where I had been fishing. The water was clear and as I sipped my coffee, I looked down to see a couple of big swirls right at my feet. The water was less than a metre deep and cruising slowly along the bottom of the wall was a large (80cm plus) Jewfish. I was stunned and by the time I got the rod, it was long gone. Recharged, I grabbed my rod and waded across to the sand bar, to the south. I stuck with the GULP Smelt Minnow and after a few casts and slow retrieves to the north, I felt a solid bite. I paused and set the hook. This time it was a bigger Flathead at about 45cm. I waded back out and on the next cast, in the same spot, the lure was hit on the drop. It was another Flathead, 50cm long. Things were now going in the right direction. I tried for more but could not find any, so at about 10.00 am I moved across to the mainland side, to fish the sand/ mud flats, by the Oyster Jetty. I decided to try out another of the DUO hard bodied lures I have in the tackle bag. It is another beautifully crafted fish tempter called the DUO Tetraworks Toto 42. It is a 42mm long, 2.8 g sinking, bibbed lure with a tight rolling action. As with all of the DUO range it has a great action and finds its rhythm as soon as it hits the water. It comes in a range of hues but I was using a bronze backed, orange bellied TS03 colour. It is a very light lure and therefore it suspends in the water column quite effectively. I cast along the edge of the weed beds and predictably, as we approached the bottom of the tide, the water turned murky. I kept picking up weed, but you need to be close to the weed to find the fish. After about 30 minutes of wading and casting, and a few Pike, I found my target. I felt a whack on the lure and then an angry head came shaking out of the water as the trebles bit. It was another good Flathead – just over 50 cm long. DUO strikes again! It had been another perfect fishing day – plenty of fish and fantastic weather – get out and catch them while you can!